Pneumatic elevation mechanism, with no pre-set locking points, will smoothly lift and lower all your desk's necessities, from 6.3 in / 16 cm to 17.3 in / 44 cm. Perfect for all heights. 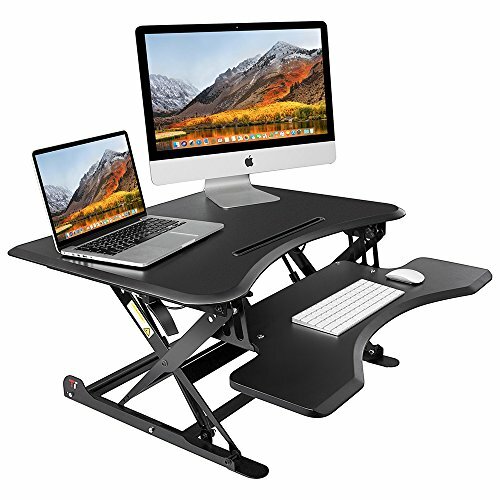 TaoTronics Stand Up Desk is just like your existing desk but straight up. It elevates vertically so you don't waste any floor space. With an upper work surface for your monitor and a removable lower deck for your keyboard and mouse, TaoTronics adjustable desk provides a perfect ergonomic working environment. This standing desk's ability to support up to 80 lbs / 36 kg is impressive considering its compact size of 32 x 24 in / 81 x 61 cm. It's nice to know that you don't have to worry about this desk tipping over, so go ahead and get that second giant monitor. It takes no time to get standing. Setup is a snap for anyone with no special tools required.